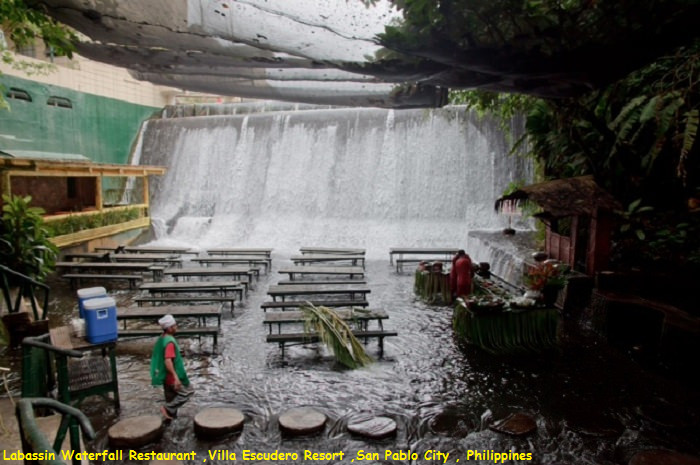 The Labassin Waterfall Restaurant is found at the Villa Escudero Resort, San Pablo City in Philippines. The unique surrounding is all natural and barely touched by people. Visitors enjoy authentic local cuisine and dine at the bamboo tables. Their feet are rinsed by the crystal clear water. What could be more refreshing in this humid climate! The running waterfall works as a natural air conditioner. Guests are also provided with some entertainment in the resort: traditional dance and music shows are often performed here. And the nature itself provides many activities: from hiking to bird watching.